I meant to post this before now! It doesn't change too much from year to year though. If you've never hosted Thanksgiving, you might check out my post on hosting holiday meals - I shared a few tips I've picked up along the way. I created a Pinterest board for my Thanksgiving menu. Feel free to click over! Right now I'm only pinning the recipes I'm using this year. 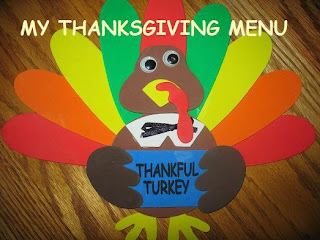 But after Thursday I'll also pin recipes there that I've used for past Thanksgiving dinners. Are you making anything for Thanksgiving? Are you hosting? I'd love to know what your favorite recipe is! Have a blessed and relaxing Thanksgiving Day friends! That is awesome! I LOVE that you are making that much food for just 6 people :) My mom only had 9 this year, her smallest ever, and still did a turkey and a ham and most of the usual, but... this (ahem) takes the cake. I do love Thanksgiving leftovers though!